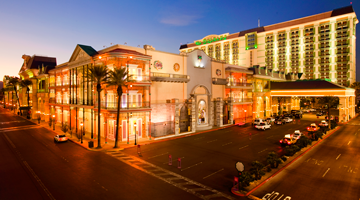 Located a few minutes west of the Strip and adjacent to the Orleans Arena, The Orleans is a convenient and affordable place to stay during your next trip to Las Vegas. We proudly offer 1,886 beautifully appointed rooms and suites featuring the ultimate in luxury and comfort. Our oversized rooms are actually "Petite Suites" with separate sitting areas. The Orleans' exquisite one and two-bedroom suites provide all the conveniences of home. Spectacular views face the glittering Las Vegas Strip or the sweeping mountain panoramas surrounding the Las Vegas Valley. Free shuttle service is available to our sister property The Gold Coast as well as the Las Vegas strip.